Berthoud Highlanders 4-H Club float in the Fair Parade in Loveland. The County Fair Parade took place a couple days before the official opening, but the activities had started even before that as 4-H kids were busy setting up exhibits and competing in the equine events. 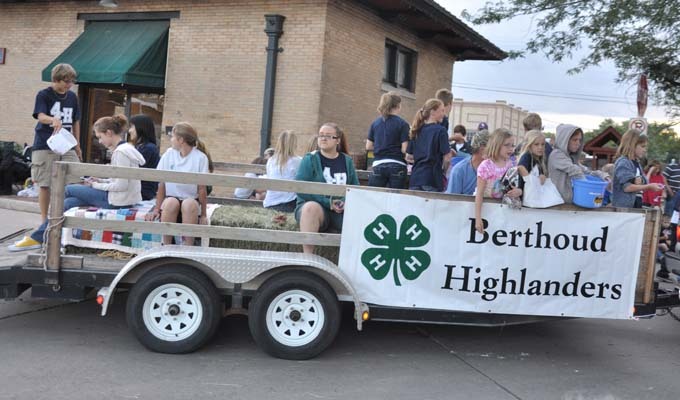 Here the Berthoud Highlanders 4-H Club took time to enter the parade. 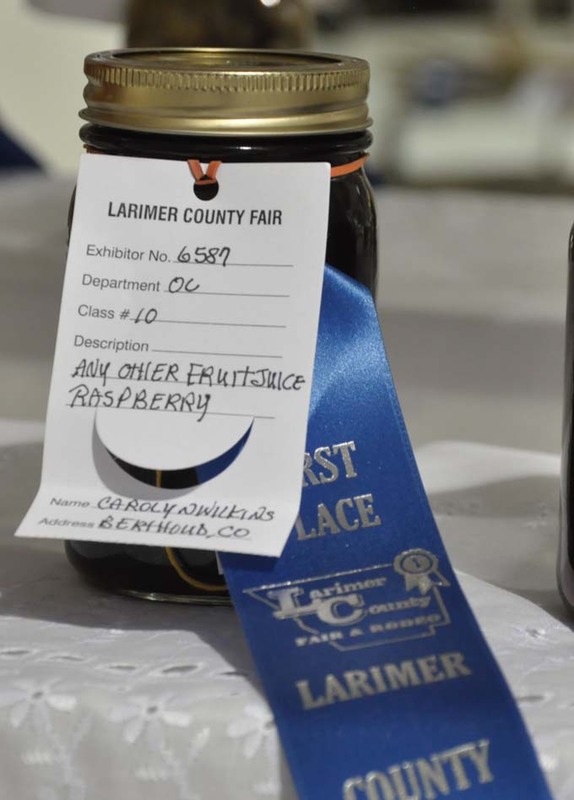 The Larimer County Fair is over but the memories linger. The midway was open and many people enjoyed the activities. The weekend had many outside activities to enjoy, but much of what the fair is about took place in the exhibit halls and the Ranchway Indoor Arena and Pavilions. Many of the exhibits in the open class were created by Berthoud folks. Elizabeth Markham’s cooking and field crops were, as usual, outstanding. Krista and Kyle Markel did some amazing things in the youth category. Carolyn Wilkins was the only local quilter to show this year. Perhaps the demise of the quilt shop and quilt show have something to do with that. Photos, fine art, canning and cooking and quilts are all represented in the photo gallery that follows. Results of the judging are available from the “County Fair” tab of the home page of the Recorder Online. Carolyn Wilkins wins blue with her Raspberry fruit juice. The Livestock judging for 4-H was continuous from before the official opening of the fair until Tuesday. It is certainly one of the biggest parts of the fair for many of our local young people. See some of the activity in the accompanying photo gallery. 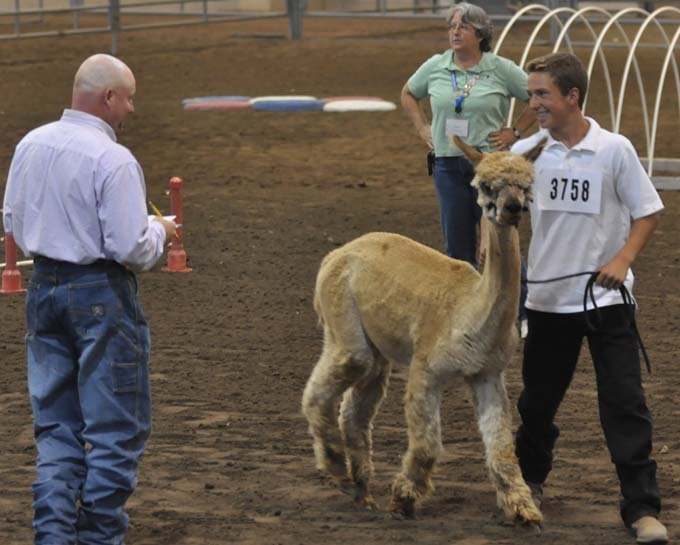 Matt Holliday shows his Alpaca, Matt placed third in Showmanship and Reserve Champion in Performance, Intermediate. The 4-H Livestock sale is also a big event and Wednesday evening 201 animals were sold for approximately $227,700. The results for Berthoud will be posted shortly. Site contents copyright © 2019 Recorder Online	except as noted. All rights reserved. | 123 queries in 2.488 seconds.